This is a drawing of my mind. One evening I returned from work with a lot on my mind. I decided to return to my childhood roots of putting pen to paper for a period of concentrated drawing. A slightly meditative process as pointed out by a Monk I sat next to on an aeroplane, but not strictly meditation. This is what I ended up with.. The outside dots represent the interconnected disparity of ideas that compete for my attention. And finally the wall or membrane that battles to keep my thoughts at bay. I believe that the more we think and our minds race, the more time we must dedicate to returning to a place of stillness and balance. The kind of feeling you get after finishing a big task and you spend an evening running around in the fresh air. You walk with feeling of freedom and sit calm and ready to take on the world. You are in the moment. Everything is in order. The extreme opposite end of the spectrum is the muddledness. 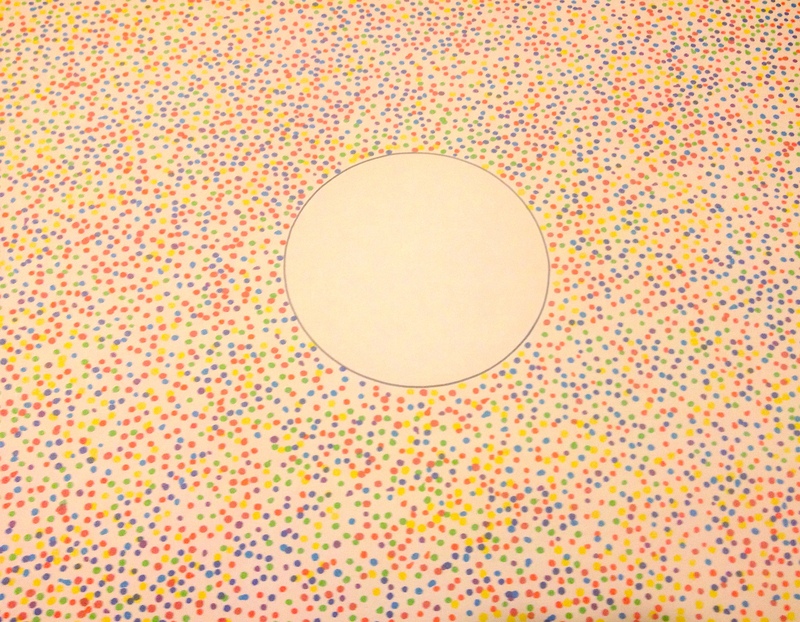 Where the colourful dots infiltrate your space. They crowd you, overwhelm you and stop you thinking clearly. Your choices become either panicked or you make no choice at all. You retreat into a space until the tornado of thoughts has to subside. For the creative types, dreamers and deep thinkers, this can be a common place. A disorganised muddle that you can’t understand. You over active and visual mind plays at a thousands miles an hour. – giving you this idea and that, and this one or that one, or this alternative and something else unrelated and interesting. Psychologists analysing your gifts and talents may award you with having a prolifically creative mind. They might look to your for answers, to connect ideas seemingly unrelated, to conceptualise things on a deeper level or to give insights where others can’t see. They would see your gifts and opportunities to put them to good use! But as every coin has two sides. This way of thinking is not always so helpful. For managing your time and getting tasks done. For making rational decisions and planning ahead. For the the logical times when your instinct or empathic reaction may not be what is needed. These are the times we must learn to stop. To breathe and navigate our way out of maze we’ve walked into. By writing things down or talking things out, we must let thoughts rise and fall, before settling like muddy water disrupted at sea. We must get clear. The best advise I have is to get your ideas out onto paper. Somewhere you can see them and then organise them. Talk them through with something that will understand.